The weighted average rate increase is 28.5 percent. 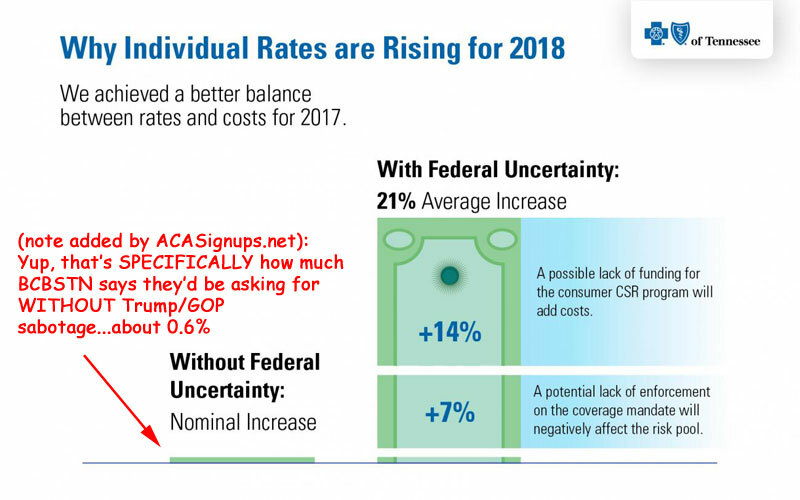 ...88 percent of Tennessee exchange enrollees receive premium subsidies, and those subsidies will increase to keep pace with the average cost of the second-lowest-cost silver plan. Silver plans will be more expensive than usual in 2018 in Tennessee, as the Trump Administration has not committed to funding cost-sharing reductions (CSRs) for 2018, and Congress has not allocated funding for them either (details below). TDCI confirmed that the additional premiums that are necessary to cover CSRs in 2018 have been added to silver plans, which will result in even larger premium subsidies for 2018.